Beatmania II DX 13: Distorted introduced a variety of new features, and also features a new Beatmania logo. Hi-Speed modifications can now be changed during the song itself, and the game also includes 2P FLIP, where both players switch note patterns. Also of note is the vast amount of new songs and crossovers from other Bemani games. Different software versions of the game are referred to as 'styles', with the different IIDX styles varying mainly in their songlists and graphical interfaces. The controls across all of the different styles remain the same, with the Beatmania IIDX cabinet controls consisting of two turntables, and two keyboards each with seven keys. This is a main difference between the original Beatmania and the Beatmania II series, with the Beatmania keyboard only consisting of 5 buttons per player. Other notable features of the Beatmania IIDX cabinet are the widescreen 16:9 display; and the powerful speakers and bass platform that vibrates beneath the player's feet. The gameplay involves the player selecting a song, with the player then having to match the notes by pressing the keys and scratching the turntable in time with the music. Beatmania II DX 13: Distorted introduced a variety of new features, and also features a new Beatmania logo. Hi-Speed modifications can now be changed during the song itself, and the game also includes 2P FLIP, where both players switch note patterns. Also of note is the vast amount of new songs and crossovers from other Bemani games. their songlists and graphical interfaces. The controls across all of the different styles remain the same, with the Beatmania IIDX cabinet controls consisting of two turntables, and two keyboards each with seven keys. This is a main difference between the original Beatmania and the Beatmania II series, with the Beatmania keyboard only consisting of 5 buttons per player. 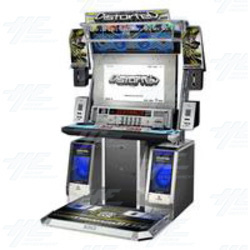 Other notable features of the Beatmania IIDX cabinet are the widescreen 16:9 display; and the powerful speakers and bass platform that vibrates beneath the player's feet. The gameplay involves the player selecting a song, with the player then having to match the notes by pressing the keys and scratching the turntable in time with the music.